Figure 3 Expression of AdipoR1 protein in the anterior and posterior pituitary. A comparison of the expression levels of adiponectin receptor 1 (AdipoR1) protein determined by Western blotting analysis in porcine anterior (A) and posterior (B) pituitary glands between days 2–3, 10–12, 14–16 and 17–19 of the oestrous cycle, and (C) between anterior (AP) and posterior (NP) pituitary glands on days 2–3, 10–12, 14–16 and 17–19 of the cycle. Upper panels: representative immunoblots (MM, molecular marker; SM, skeletal muscles – positive control); lower panels: densitometric analysis of adiponectin receptor 1 protein relative to actin protein. Values are expressed as means ± S.E.M. in arbitrary optical density units (n = 5). Bars with different superscripts are significantly different. Capital letters indicate p < 0.05; ***p < 0.001. Expression of AdipoR1 mRNA in the anterior and posterior pituitary. Comparison of adiponectin receptor 1 (AdipoR1) mRNA expression determined by quantitative real-time PCR in porcine anterior (A) and posterior (B) pituitary glands between days 2–3, 10–12, 14–16 and 17–19 of the oestrous cycle, and (C) between anterior and posterior pituitary glands on days 2–3, 10–12, 14–16 and 17–19 of the cycle. Results are means ± S.E.M. (n = 5). Bars with different superscripts are significantly different. Capital letters indicate p < 0.05; **p < 0.01; ***p < 0.001. Figure 4 Expression of AdipoR2 protein in the anterior and posterior pituitary. Comparison of adiponectin receptor 2 (AdipoR2) protein expression determined by Western blotting analysis in porcine anterior (A) and posterior (B) pituitary glands between days 2–3, 10–12, 14–16 and 17–19 of the oestrous cycle, and (C) between anterior and posterior pituitary glands on days 2–3, 10–12, 14–16 and 17–19 of the cycle. Upper panels: representative immunoblots (MM, molecular marker; L, liver – positive control); lower panels: densitometric analysis of adiponectin receptor 2 protein relative to actin protein. Values are expressed as means ± S.E.M. in arbitrary optical density units (n = 5). Bars with different superscripts are significantly different. Capital letters indicate p < 0.05;**p < 0.01; ***p < 0.001. Expression of AdipoR2 mRNA in the anterior and posterior pituitary. Comparison of adiponectin receptor 2 (AdipoR2) mRNA expression determined by quantitative real-time PCR in porcine anterior (A) and posterior (B) pituitary glands between days 2–3, 10–12, 14–16 and 17–19 of the oestrous cycle, and (C) between anterior and posterior pituitary glands on days 2–3, 10–12, 14–16 and 17–19 of the cycle. Results are means ± S.E.M. (n = 5). Bars with different superscripts are significantly different. Capital letters indicate p < 0.05; **p < 0.01; ***p < 0.001. Figure 1 Expression of AdipoR1 mRNA in the anterior and posterior pituitary. 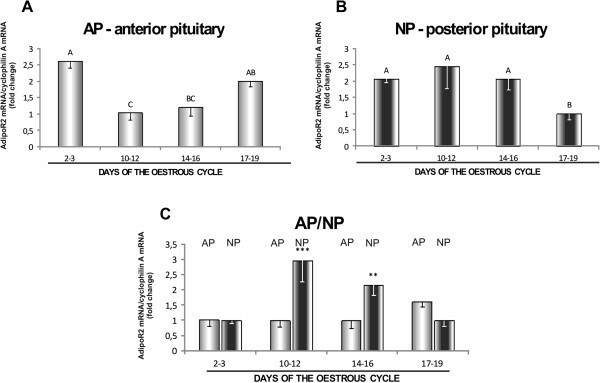 Comparison of adiponectin receptor 1 (AdipoR1) mRNA expression determined by quantitative real-time PCR in porcine anterior (A) and posterior (B) pituitary glands between days 2–3, 10–12, 14–16 and 17–19 of the oestrous cycle, and (C) between anterior and posterior pituitary glands on days 2–3, 10–12, 14–16 and 17–19 of the cycle. Results are means ± S.E.M. (n = 5). Bars with different superscripts are significantly different. Capital letters indicate p < 0.05; **p < 0.01; ***p < 0.001. Expression of AdipoR1 mRNA in the anterior and posterior pituitary. 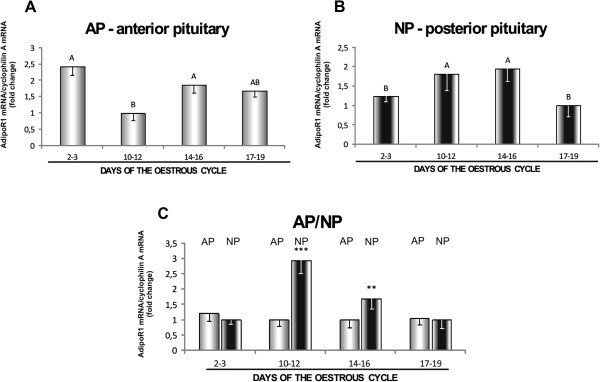 Comparison of adiponectin receptor 1 (AdipoR1) mRNA expression determined by quantitative real-time PCR in porcine anterior (A) and posterior (B) pituitary glands between days 2–3, 10–12, 14–16 and 17–19 of the oestrous cycle, and (C) between anterior and posterior pituitary glands on days 2–3, 10–12, 14–16 and 17–19 of the cycle. Results are means ± S.E.M. (n = 5). Bars with different superscripts are significantly different. Capital letters indicate p < 0.05; **p < 0.01; ***p < 0.001. Expression of AdipoR1 protein in the anterior and posterior pituitary. A comparison of the expression levels of adiponectin receptor 1 (AdipoR1) protein determined by Western blotting analysis in porcine anterior (A) and posterior (B) pituitary glands between days 2–3, 10–12, 14–16 and 17–19 of the oestrous cycle, and (C) between anterior (AP) and posterior (NP) pituitary glands on days 2–3, 10–12, 14–16 and 17–19 of the cycle. Upper panels: representative immunoblots (MM, molecular marker; SM, skeletal muscles – positive control); lower panels: densitometric analysis of adiponectin receptor 1 protein relative to actin protein. Values are expressed as means ± S.E.M. in arbitrary optical density units (n = 5). Bars with different superscripts are significantly different. Capital letters indicate p < 0.05; ***p < 0.001. Expression of AdipoR1 protein in the anterior and posterior pituitary. A comparison of the expression levels of adiponectin receptor 1 (AdipoR1) protein determined by Western blotting analysis in porcine anterior (A) and posterior (B) pituitary glands between days 2–3, 10–12, 14–16 and 17–19 of the oestrous cycle, and (C) between anterior (AP) and posterior (NP) pituitary glands on days 2–3, 10–12, 14–16 and 17–19 of the cycle. Upper panels: representative immunoblots (MM, molecular marker; SM, skeletal muscles-positive control); lower panels: densitometric analysis of adiponectin receptor 1 protein relative to actin protein. Values are expressed as means ± S.E.M. in arbitrary optical density units (n = 5). Bars with different superscripts are significantly different. Capital letters indicate p < 0.05; ***p < 0.001. Figure 2 Expression of AdipoR2 mRNA in the anterior and posterior pituitary. Comparison of adiponectin receptor 2 (AdipoR2) mRNA expression determined by quantitative real-time PCR in porcine anterior (A) and posterior (B) pituitary glands between days 2–3, 10–12, 14–16 and 17–19 of the oestrous cycle, and (C) between anterior and posterior pituitary glands on days 2–3, 10–12, 14–16 and 17–19 of the cycle. Results are means ± S.E.M. (n = 5). Bars with different superscripts are significantly different. Capital letters indicate p < 0.05; **p < 0.01; ***p < 0.001. Expression of AdipoR2 protein in the anterior and posterior pituitary. 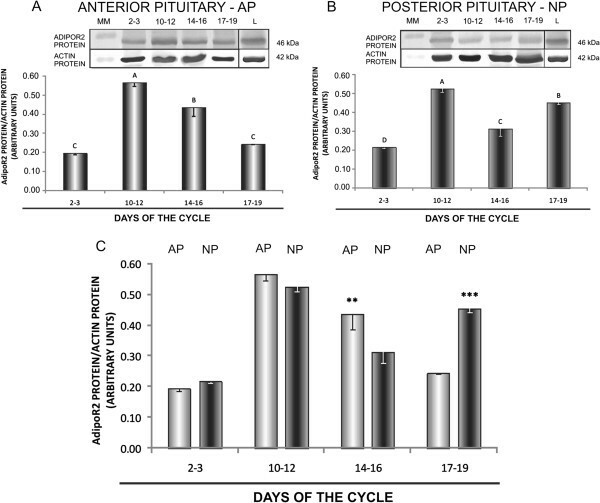 Comparison of adiponectin receptor 2 (AdipoR2) protein expression determined by Western blotting analysis in porcine anterior (A) and posterior (B) pituitary glands between days 2–3, 10–12, 14–16 and 17–19 of the oestrous cycle, and (C) between anterior and posterior pituitary glands on days 2–3, 10–12, 14–16 and 17–19 of the cycle. Upper panels: representative immunoblots (MM, molecular marker; L, liver – positive control); lower panels: densitometric analysis of adiponectin receptor 2 protein relative to actin protein. Values are expressed as means ± S.E.M. in arbitrary optical density units (n = 5). Bars with different superscripts are significantly different. Capital letters indicate p < 0.05;**p < 0.01; ***p < 0.001. Expression of AdipoR2 mRNA in the anterior and posterior pituitary. 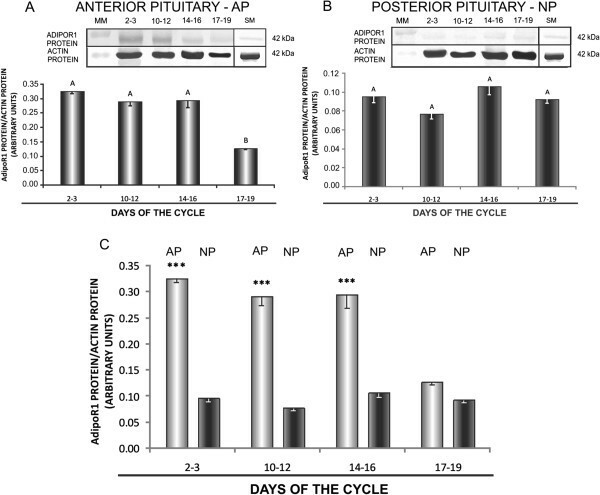 Comparison of adiponectin receptor 2 (AdipoR2) protein expression determined by Western blotting analysis in porcine anterior (A) and posterior (B) pituitary glands between days 2–3, 10–12, 14–16 and 17–19 of the oestrous cycle, and (C) between anterior and posterior pituitary glands on days 2–3, 10–12, 14–16 and 17–19 of the cycle. Upper panels: representative immunoblots (MM, molecular marker; L, liver-positive control); lower panels: densitometric analysis of adiponectin receptor 2 protein relative to actin protein. Values are expressed as means ± S.E.M. in arbitrary optical density units (n = 5). Bars with different superscripts are significantly different. Capital letters indicate p < 0.05; **p < 0.01; ***p < 0.001.